Released in June 2018, “Unearth The Underworld” is a 5 track EP from Edmonton, Canada’s death/thrashers, TESSITURA. Featuring five of the band’s strongest efforts to date, it takes the listener on the rollercoaster of TESSITURA’s evolution as each song drives forward into a whirlwind of themes and expressions. Now, drummers and all fans of the band can see the masterwork of Gord Alexander as he pummels away to “Wounds of The Righteous” in his latest playthrough video via GearGods,net. Suitable for death and thrash fans of all sorts, but especially those with an interest in Goatwhore, Revocation, and Skeletonwitch can pick up “Unearth The Underworld” or catch TESSITURA at one of their live performances (dates listed below). July 12 – Armstrong, BC – Hassen Arena – Armstrong MetalFest w/ Origin, Nekrogoblikon, Betraying The Martyrs, Wake & more! Aug 3 – Drumheller, AB – Dinosaurs Downs Stampede Grounds – Loud As Hell Fest w/ Goatwhore, Anciients, Cloven Hoof, Planet Eater, Untimely Demise, BornBroken, Arrival of Autumn, Legacy, VX36 and more! Since 2008, Edmonton-based Tessitura has been taunting the Western Canadian underground metal scene with their eclectic blend of melodic death metal, progressive music, and classic thrash. They meticulously craft their unique sound by layering the edge-of-your-seat, earth-shaking guitar work of Stephan Ceña, backing it up with Leillyn McColman’s uplifting bass lines and the driving drum patterns of Gord Alexander, and refining the sound with the dual-vocal freight train of Ceña and lead vocalist Cyn Mercredi’s powerful screams and haunting growls. Leaving behind the more technical borderline progressive style found on the first two albums, ‘Battle to Eternity’ (2010) and ‘Savage Embrace’(2013), they embrace their grittier side with ‘Unearth the Underworld’ (2018). The unmatched energy they inject into their fans can be experienced at one of their thunderous live shows or on any of their releases. 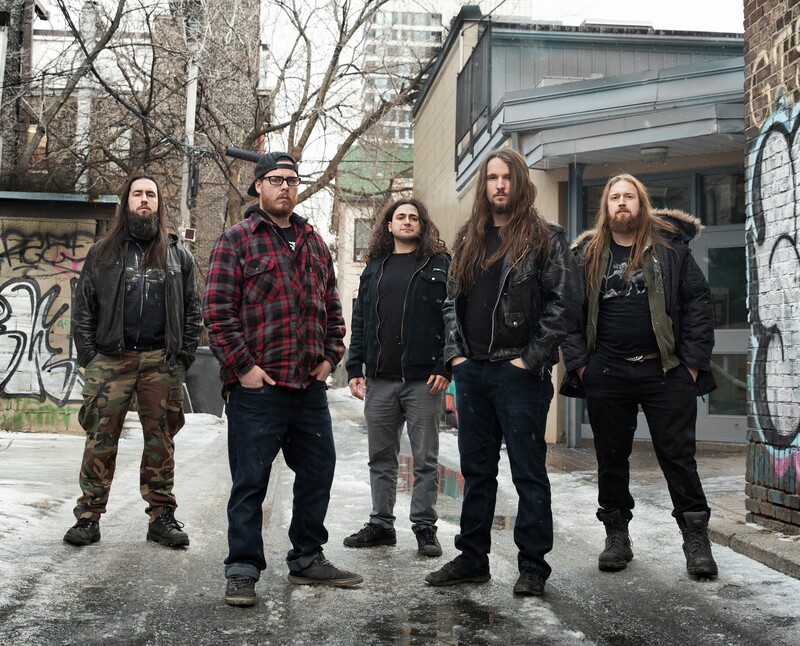 Kitchener’s Invicta strikes out on a thrash attack across Canada this spring in support of Italy’s Ultra-Violence making it one of the most aggressive thrash tours of the year. Heavy and violent, yet catchy and melodic Invicta has been ripping up stages since their inception in 2017 and is excited to punch the audiences in the face with a thrash metal fist. Invicta formed in 2017 is a thrash metal band hailing from Kitchener, Canada. Created by Kyle Edissi (guitar/vocals), he later recruited Jonah Kay (guitar), Shareef Hassanien (drums) and Steven Rowlands (bass) to complete the lineup and breathe life into his vision. The first EP “The Executioner” was recorded in 2018 (with then bassist Gabe Rosa) and it was met with great furor. Now, in 2019, Invicta will unleash their second release, a full length entitled “Halls of Extinction”, which takes the band on a darker, more intense and morbid sounding path. This evolution and maturity sees the band focus more on theory and technicality without losing melody. New Album “Sinister” Out Now! Drawing their inspiration from a wide variety of genres, OMINOUS ECLIPSE is a brutal quartet that create a unique hybrid sound with death metal being the main aspect combined with elements of thrash, groove, black, melodic, etc. Unleashing their sophomore album “Sinister” this past September, the band have put together a new lyric video for their track “Breaking The Chains” premiered on Bravewords.com. For those in the Ottawa area, OMINOUS ECLIPSE will be performing on December 11th opening for The Faceless, Rings of Saturn, Vales of Pnath and more at Mavericks. Full details here. Plus available on Bandcamp, iTunes, Amazon, Google Play and Spotify. “Sinister” follows their 2015 debut full length “End Of Days” and EP “Beyond The Apocalypse” released that same year. Active since 2014, OMINOUS ECLIPSE is a very ambitious band passionate about writing and playing extreme music. They have already shared the stage with the likes of Revocation, The Agonist, Kalmah, Archspire, Incantation, Vesperia, Beyond Creation, Rivers of Nihil to name a few. Drawing their inspiration from a wide variety of genres, OMINOUS ECLIPSE is a brutal quartet that create a unique hybrid sound with death metal being the main aspect combined with elements of thrash, groove, black, melodic, etc. Unleashing their sophomore album “Sinister” last month on September 14th, the band will be performing their hometown CD release show on October 6th at House of Targ in Ottawa along with performing in Montreal, QC the following week on October 13th at Piranha Bar. The album follows their 2015 debut full length “End Of Days” and EP “Beyond The Apocalypse” released that same year. Active since 2014, OMINOUS ECLIPSE is a very ambitious band passionate about writing and playing extreme music. They have already shared the stage with the likes of Revocation, The Agonist, Kalmah, Archspire, Incantation, Vesperia, Beyond Creation, Rivers of Nihil to name a few. With their mind bending guitar solos, devastating heavy riffs, blistering drum fury and dynamic vocal performances from new lead singer Josh Stephney along with bassist Dan Ayers, Toronto’s SLUDGEHAMMER will be pounding Western Canada this June for their “Hammering Westward Tour”, which includes a performance at this year’s Decimate MetalFest in Calgary on June 8th. Supporting them on select dates of the tour will be Regina, SK’s groove metal Kelevra. The tour will see SLUDGEHAMMER kick off the rampage in Toronto on June 1st and venture west to as far as Vancouver, BC to wrap things up back in Ontario on Guelph on June 23rd. SLUDGEHAMMER‘s debut album “The Fallen Sun” was released in 2016 featuring fan favourites “Carrion Eater” and “Demons From The Woodwork” plus peaked at #4 on the Canadian College Radio Loud Charts along with multiple praise from publications such as Bravewords, Blabbermouth and No Clean Singing. Here’s what they had to say. “The Fallen Sun” is available for stream and download on Bandcamp, iTunes, Spotify and all other major online retailers. Sludgehammer is a five piece Canadian metal band formed in 2013. The band began with guitarist Jeff Wilson and drummer Fernando Villalobos jamming together, which quickly resulted in writing songs and searching for a full line up. Their search led to vocalist Chris Szarota, who possessed an astonishing vocal ferocity and bassist and vocalist Dan Ayers, who passed the audition as a bassist and also revealed a golden voice. Thus, the first incarnation of Sludgehammer was formed. The four members worked hard over the next few months to put together a demo, which was released at the band’s first gig on November 22nd, 2013. The demo was well received even though it was completely self-recorded and the gig offers kept on coming, along with new fans. With the success of the demo, the band knew that it was time to step things up and hired producer Christian Anderson for their 2014 release, ‘Organ Harvester’. During the writing sessions, the band decided that Chris and Dan should share vocal duties for this record, as Dan’s voice had been absent from the demo. The dual vocals proved to be a force to be reckoned with and on August 11th, 2014 ‘Organ Harvester’ was released to rave reviews. ‘Organ Harvester’ gained both new fans and better shows, gathering serious momentum and solid name among the metal community. However by 2015, after playing many gigs with the ‘Organ Harvester’ material it became very obvious that the fans were hungry for more. The band began writing more songs for the next release and kept playing gigs, which led them to guitarist Tyler Williams. Tyler was working as a sound man at the Atria in Oshawa, ON where Sludgehammer was playing, and after their performance, Tyler approached the band. They set up a jam and in July 2015, Tyler Williams joined Sludgehammer. The new five piece line up produced a much fuller sound as Jeff and Tyler began working together. The old songs were given new life and badass new material was being written for their next release, titled ‘The Fallen Sun’. The new songs featured dynamic vocal performances from Dan and Chris, mind bending guitar solos, heavy riffs and blistering drumming. As the songs started to pile up, Sludgehammer discussed recording a full length album. Tyler suggested that they record at his studio, Monolithic Productions. The band set up shop there and unleashed ‘The Fallen Sun’ on June 10, 2016. 0 NEWS: GearGods Premiere Guitar Shredder Matt Chanway Playthrough Video “The Receiver of Wisdom” + Debut Self-Titled Album Out Now! Debut Self-Titled Album Out Now! Guitar virtuoso Matt Chanway has made a name for himself with well-regarded Canadian death/thrash metal band Assimilation. Last December, Chanway unleashed his self-titled solo debut album: a sonic masterpiece that merges the old and new school. Razor sharp riffs meld with soaring solos; progression with power. Inspired by the likes of George Lynch and Jeff Loomis, Chanway (who has a diploma in guitar performance from the University of West London) is the ideal guitar hero for the 21st century. Chanway is preparing to enter the studio with a brand new line-up to record his follow up EP set for release in early 2018.